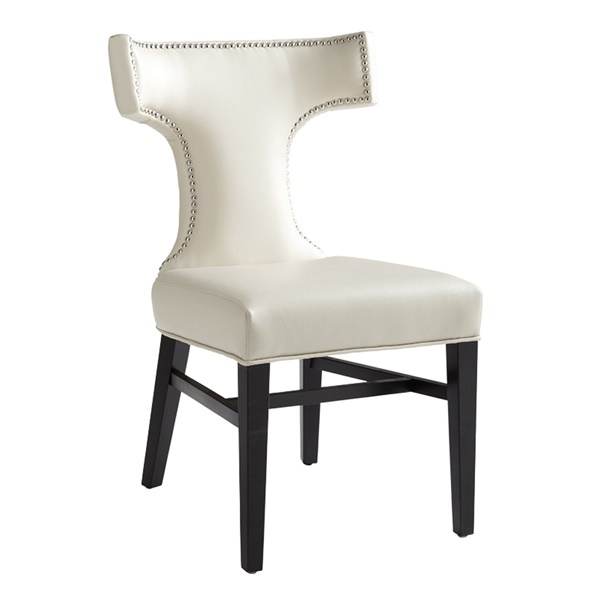 Dress up your dining area with the bold, yet simple artistry of the Sunpan Serafina Dining Chair. This elegant chair’s clean lines and distinctive design will have your dinner guests talking, and will certainly make a statement around your dining table. The Serafina’s frame is crafted from solid wood for a look that’s sure to last through years of dinners, desserts, and game nights. The frame is finished in matte black for a soft touch of sophistication. The chair’s back and seat are nicely padded for optimum comfort, and the chair’s wide “winged” back offers optimum support. The Serafina is upholstered in sleek and durable bonded leather that comes in your choice of stylish colors. Meanwhile, nail head trim around the chair’s back adds a touch of classic charm and character. This chair looks great around a contemporary dinner table, but you can also use it as an occasional chair in a living room, office space, or any space that needs comfortable and stylish seating.